Both this and Dark Matter clearly owe a big debt to Firefly. This, however, feels kind of like Burn Notice set in the Firefly universe. That is an endorsement, not a complaint. Dutch and John play off each other well and I could watch them all day. I'm underwhelmed by D'avin but maybe he'll grow on me. More than anything else I'm intrigued by the world they're building and I want to get to know more of it. Did anyone else notice that one of the supporting actors in this also played a big role in the pilot of Dark Matter? So.. is this any good? I kept thinking I should should check it out, then I'd see another clip that just looks terrible! Like the cheesiest rip off of firefly that didn't understand what firefly was. I think it's worth checking out! I really enjoyed it. It didn't feel like a Firefly ripoff, more like an homage. I liked it, too - it was fun, each of the three main characters interested me, and the universe felt really well-built for a pilot episode. I liked the relationships between Johnny and Dutch, and between Johnny and D'avin, and even the flirtation between Dutch and D'avin worked for me. The brothers definitely felt like brothers to me - I bought that relationship right off the bat. When I was done watching, I really wanted to watch another episode immediately. Can't wait to see where this is going! The bad acting is killing me, regardless of how much I wanted to like this. Probably because I miss Firefly so goddamn much. I didn't love it, but I liked it enough that I'll keep watching (unlike Dark Matter, which I didn't make it past 15 minutes of watching). It's pretty, and I'm curious about what all of the backstories will be. The bad acting is killing me, regardless of how much I wanted to like this. Yeah, the acting was not good. But it was a pilot, and sometimes it takes time for a new cast and a director to get the hang of working together, so I'm going to stick with it for awhile. It could be fun. The only thing this show has going for it is a cool name. It'd have made a great VHS cover, but I'm not so sure this is going to be a good series at all. I like the premise and the world-building. I felt like the actor playing D'Avin was a bit flat but the ones playing Dutch and John were just fine. I'm interested to see where it goes. I like that both this and Dark Matter have women as the ones in charge. Firefly is what, 12 years under ground now? Maybe it's time to let it go just a little. This show is at least as much an homage to Cowboy Bebop as it is to Firefly. Don't get me wrong, I love/loved Firefly, but I am a little sad for science fiction television, as a genre, that everything must be compared to Firefly. I thought the acting was decent, though not outstanding. Both Dutch and D'avin seem to be somewhat emotionally closed-off characters (especially D'avin), which is A.) challenging to act and B.) it's easy to confuse a faithful portrayal of a wooden character with a wooden portrayal of normal character. I am optimistic that as their character arcs progress they'll open up more and things will improve. They better watch out for that bartender though, that guy is a total scene-stealer. I liked the world building, and I particularly liked how the writers managed to fairly deftly weave in a lot of world-building without many glaringly lengthy exposition dumps, particularly of the "here is a computerized voice giving you an info dump about [world] or [technology]" or any of the other sci-fi exposition-dump cliches. "Yeah, the acting was not good." That's funny, because I just wrote in the Dark Matter thread that I think the acting in this show is good. I just now finished watching it. Maybe my judgment has been skewed by Dark Matter, which is very weak (though I'm going to continue to give it a chance for a while), and so this show looks very good by comparison. But I thought a lot of the acting was surprisingly good -- like the scene in the bar with the religious/revolt leader guy. He delivered his lines very well, I thought. I thought the bounty-hunter boss-woman/mentor was quite good, too, even though she like everyone else on the show is cliched character. Mostly, I was disturbed by how the brother constantly reminded me of Tom Cruise. I didn't have a problem with the acting in this either - for a pilot, I was pretty pleased. I expect it will get better as the actors get a better handle on their characters. Having now watched it I retract my previous firefly comparison I was misled by a quippy section which wasn't really representative. The acting seems more or less fine, the writing is a bit clunky, but serviceable. It didn't super grab me, but it was certainly entertaining enough that I'll give it a good chance. Came in with no expectactions. The presentation and production are pretty good. The acting was fine for a pilot. I agree with rednikki's comparison with Burn Notice. 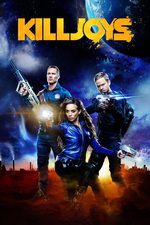 If Killjoys can consistently match 2/3rds the quality of Burn Notice, then it'd be a pleasant success. The worldbuilding is definitely intriguing. Some of the "underworld" stuff kinda felt like Firefly's "underworld" stuff, and the gritty worn-in look in some places. But that's just competent execution of a pretty standard trope. I do like that Dutch wears sensible boots. Finally watched this with my wife. D'avin reminded my wife too much of Grant Ward (Agents of S.H.I.E.L.D. ), while I kept seeing some weird mix of young Trent Reznor and ever burly Henry Rollins, so I was amused by her annoyance at the character. I get the general Firefly vibe -- a small group of crafty folks, operating on the edges of a future outerspace society, where there's the big corporation/government that controls most things, with plenty of cracks for black markets to thrive and gaps where people are scrounging to survive. As for the show, a good start, and good to see people still discussing it. My wife kept getting annoyed about how long her hair was, which made me think of the "no capes" scene in The Incredibles. Do you remember ... Thunderhead? The RAC have certainly grown, couldn't the English woman have told them that was a crap name for their oppressive bounty hunter masters?